The bumper sticker “Don’t Steal, Government Hates Competition” comes to mind when one reads news like this recent one announcing the feat of our military through the Joint Task Force’s Operation Pulo Shield in destroying 748 illegal refineries in the Niger Delta in four months. The outfits’ media coordinator Lt. Col Onyema Nwachukwu must have felt very proud revealing this to news men, very fitting report card to justify the huge sums the country is expending to keep the operation on, you will agree. But really, are we not simply short changing ourselves with this sustained posturing and grandstanding of describing the local refineries in the Niger Delta as illegal and criminalizing their operations? I think we are and it is time we stepped back and thought through it again. Before any one accuses me of treason or at the least, of supporting any illegal activity against my country let me state here that I agree fully with the argument of the Government against the existence of this refineries. I agree with them to the extent that they are facts but I differ on the approach to handling this fact. I mean, it’s a fairly logical argument. 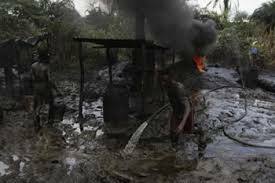 The country continues to lose millions of dollars due to theft of crude oil used by operators of these ‘illegal’ plants which in addition operate below acceptable environmental standards aggravating the already bad state of pollution of the region. The products of the refineries are also adjudged to be substandard and harmful to both the health of citizens and automobiles. Above all, as a reputed oil producer and OPEC member, Nigeria ought to be in the league of decency and global acceptability in refining its oil. The above sound like good justification for the ‘describe them as illegal and send the military after them’ approach which the government has adopted in fighting the menace. Reports of successes like the one mentioned above might sound like progress in this direction but in truth, we are simply running round a widening gyre. The refineries are not going away, they simply relocate. The business as presently ran is so lucrative that those involved are ready to play dirty. And while we chase them around, we encourage the large scale pollution of the environment and lose out on a golden opportunity at what I will describe as a home grown technological alternative to crude oil refining. It is an irony that a country, whose four refineries are not fully operational, would be destroying ‘illegal refineries’. Since the discovery of oil in 1958, we have really never gotten a hang of how to go about refining the crude locally. Today, many decades and four gigantic refineries later, we depend largely on imported refined crude to meet domestic consumption, a situation that gave room for what is perhaps the largest sleaze in our history – The fuel subsidy scam. Over the years, successive governments after superintending the mismanagement of the four refineries continued to mouth their desires to build functional refineries in the country. At some point, licenses were even issued to private businesses. All to no avail. In recent time, the government has given assurances of the construction of Greenfield refineries and in another instance even signed an MoU with an American firm for the construction of six modular refineries under a joint venture with a cost of up to $4.5bn all of which we are still waiting to see materialize. This is outside of the billions of dollars already spent trying to turnaround (or raise from the dead if you like) the existing refineries. We cut the picture of a people simply running from pillar to post not sure of how to solve our problems. This is even more nauseating when we consider the fact that we actually have a local answer which we have refused to take seriously. Like in all things, we do not give any credibility to what is our own unless such a thing or person has obtained acclaim from abroad. An exhibition of neo-colonialism of the gravest form. The ‘illegal’ refineries are a testimony to the ingenuity of the Nigerian and his ability to creatively innovate, despite the challenges of his existence, to solve his daily challenges, a resource which our system neither encourages nor supports. In more serious countries where human resources are priced and innovation is celebrated, such ingenuity as has been exhibited by operators of the so called illegal refineries would rather than being criminalized, constitute the foundation of technological breakthrough. The crux of this discussion is the need for the government to make a U-turn in its approach and seek ways to make the most out of them to the benefit of the economy, the environment and the citizens involved within the ambits of the law. The Government should be curious to know how they are successfully refining even in makeshift plants and see how to improve on it to make it both healthier and more efficient. Currently, the operations are unregulated and thus anything goes, allowing a scenario where all characters are welcomed to play. Government should get them together and organize them may be into co-operatives or structured production clusters and regulate their activities, their sources of crude, the refining process, the pollution of the environment and who they are selling to. This Government has stated repeatedly that it intends to fight unemployment by encouraging the independent initiatives of young people across the country. This is one area through which it could meet the targets in this regard. The ‘illegal’ refineries currently provide employment to a large number of people and have the potential of employing many more should their activities be standardized and regulated. This is particularly important in the Niger Delta where years of neglect has raised a generation of unemployed youths who are quick to take to criminal activities for survival in the absence of alternatives. This way, we will be killing many birds with one stone. The ‘illegal’ refineries and other such home grown innovative ideas and indigenous technologies including those which appear like criminal manifestations must be harnessed for Nigeria to advance technologically and transform her economy in line with the vision of being one of the top twenty economies of the world by 2020. If we however continue in the self indulgence of using the state fire power against them and describing them as illegal, we will continue on this sightless thrashing like a beheaded chicken, until our final expiration. This is a great write-up! It has always beaten me hollow when I see on television the destruction of these local refineries. I always felt that we can do something about this to translate them from illegal status to full scale industrial production. I got a break on this when I was appointed the Vice-Chancellor of the Federal University of Petroleum Resources, Effurun (FUPRE) in May this year. I’ve put a plan in place to upgrade these local refineries to small-scale industrial systems that will achieve greater production efficiency, better product quality conforming to standard environmental practices. We hope to come up with an acceptable locally designed and produced oil refinery soon. Hello Prof, Thank you for your comment. I am glad you found my humble intervention interesting and incisive. Like you, I am saddened by the destruction of these so called illegal refineries. I am also very impressed that you have thought it wise to use your new position to harness this technology for the good of our country. Gods speed in your new position. Thank you very much Prof. I have the same ideology with you, in fact I am working on a paper which part of this your idea will form my statement of problems. We must join forces to advanced the genuine course of Niger Delta struggle. on February 22, 2016 at 1:17 pm | Reply Dr Mrs Asuru. Please, I will love to have some of the pictures of the ‘illegal refineries and the destroyed once. It will enhance my work. Once more , thank you.